DDOT opened the inbound 11th Street Bridge this past weekend. Drivers are already confused, not from the change in the lane split from I-295, but in the route number chosen for the bridge: I-695. My photo from before the opening. Why did DDOT sign the bridge as I-695? This is a question that been pondered by blogs, the news media, and numerous tweets. The confusion got so bad that DDOT wrote their own post to explain. As it turns out, the Southeast Freeway between the 3rd Street Tunnel and the 11th Street Bridge has always been I-695, but there were no signs listing it this way. Instead, signs at on-ramps on Capitol Hill, for instance, listed choices as 295 South (toward Anacostia) or "to 395" (toward Virginia or New York Ave). In late 2008, DDOT submitted a request to the American Association of State Highway and Transportation Officials (AASHTO) and the Federal Highway Administration (FHWA) to de-designate I-295 north of the Anacostia side of the 11th Street Bridge, and to extend I-695 across the 11th Street Bridge to meet I-295 and DC Route 295. DDOT said the purpose was to "rationalize the freeway system in the District." But people are asking, if I-695 has existed all these years along the Southeast Freeway, why hasn't it been signed? Not even DDOT knows for sure, but one possible reason is that it was intended to go farther. 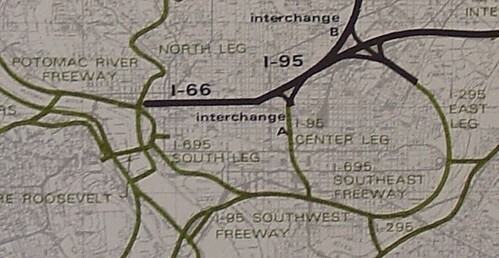 This image, from a 1970 study, shows one of the alternatives for an extension of I-695 as part of the DC Interstate system. 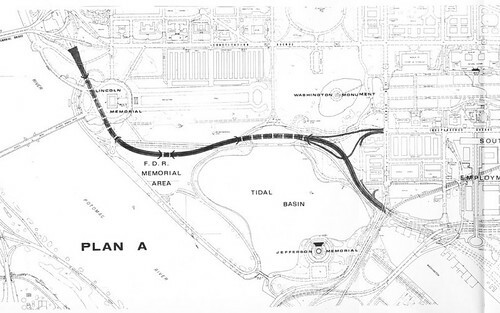 Dating in some form back to the mid-1950s, I-695 would have continued west from the 3rd Street Tunnel, diverged from the Southwest Freeway at Maine Ave, and continued northwesterly to meet I-66 at Constitution Ave NW. The ramp configurations at I-395/Maine Ave SW and at I-66/Constitution Ave NW are remnants of this long-ago plan, officially killed by then-mayor Marion Barry in 1980. This segment might have been partially signed before it was cancelled. There's an empty space on the sign bridge on westbound I-66 just north of the E Street Expressway that might have housed an I-695 sign, and an associate of mine has reported that he recalls an I-695 sign on the inbound Theodore Roosevelt Bridge back in the 1970s. Any such signage has long since disappeared, however. This map, from the 1971 DC Interstate System study by DeLeuw, Cather & Associates, shows how the longer I-695 would have fit into the context of the freeway system proposed for the DC core. As it connected I-66 with I-295 around the south side of the core, it would have been long enough to warrant signage. Since the South Leg was cancelled, plus the lack of connections between the 11th Street Bridge and DC 295, there was less of a need to sign I-695 after the freeway cancellations. So why sign I-695 in DC when there's an I-695 around Baltimore, some ask. Wouldn't that just cause confusion? It might for unaware drivers and tourists, but there's precedent for signing nearby Interstates with the same number. We already have that in the DC area: both DC and Baltimore have I-395. An example with even less intermediate distance can be found in New England. I-291 exists in both Springfield, MA and suburban Hartford, CT, separated by only 22 miles. By comparison, over 31 miles separate DC's and Baltimore's I-695. Now that DDOT plans to remove the Southeast Freeway spur to Pennsylvania Ave and is building connections between the 11th Street Bridge and DC 295, the agency has decided to reintroduce us to I-695. To reduce driver confusion, DDOT should install consistent signage all along I-695 and at the interchanges at both endpoints. Only time will tell if drivers can adjust to the "great route experiment." Cross-posted on Greater Greater Washington. Coming out of tonight's Mt. Vernon Transportation Committee meeting: the committee is open to the concept of allowing bicycles on the George Washington Parkway on the weekends. I don't think we have support for an all-weekend allowance, but most of the committee members there tonight are open to the idea of at least partial hours for bikes on the weekend...most likely on weekend mornings. The next step would be to draft a resolution or letter of support for the Mt. Vernon Council of Citizens Associations to approve and pass on to local elected officials and the National Park Service. As the committee's unofficial bicycle advocate, I've also been asked by the committee chair to invite WABA and FABB to speak at our next monthly meeting.